Are you currently an undergraduate or high school student interested in becoming a dentist? Are you a pre-dental student looking for an opportunity to boost your resume and learn the ins and outs of dental school? If you answered yes to any of those questions then we have the perfect event for you! 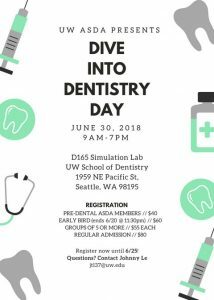 University of Washington School of Dentistry’s ASDA chapter is hosting one of its main pre-dental events, Dive into Dentistry Day. This workshop gives you the chance to get hands on experience and gain an insider’s perspective on life in dental school. 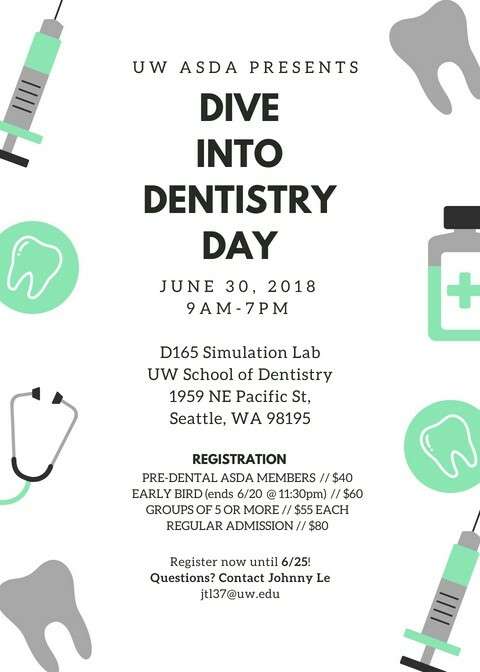 This year’s Dive into Dentistry Day is going to be awesome! With current UW dental students and faculty running the show, you’ll get a chance to learn all about life at UWSOD. There will be a chance to meet various dental students, current dentists, and hear about how admissions work at UWSOD. We’ll teach you how to drill and fill a cavity preparation, sculpt a tooth out of wax, suture, take an impression, and ace your dental school interviews. By the time you’re done, you’ll be practically ready to work with your own patients! This is a great opportunity to learn about dental school, meet some fellow pre-dents, get all your questions answered, and build up those ever important resumes. Don’t miss out on this amazing opportunity! Please feel free to contact me, chenhao@uw.edu, with any questions. We hope to see you there!